Balance, Impatience, The Healing Truth, The Curing, Flight and now DreamState. Book 6 is done! It may at present be a rough draft however getting the last word down is always such a great feeling. This is the novel I began during last years NaNoWriMo. Suffice to say with conventions, editing and the odd moment of fandom here and there, I struggled for free time across the first quarter of 2013. I only found time to focus on this story during the last few months and I’m very glad I did. I love this book, its so very different to all the others and has an exciting pace to it. At 70,000 words DreamState is an urban paranormal action blockbuster with a hint of science fiction. I can honestly say I’ve never read a book quite like this before. If my proof readers are right it just might take the world by storm. Well possibly after copious editing, watch out 2014! First chapter – PDF format. It’s not every day you get to meet the person who started it all. For me many, oh so many years ago, I borrowed a copy of Magician on the advice of a friend. This weathered tome sat thick and awkward in my youthful, 13 year old hands as I remained doubtful I could read something so large. All my school novels to date had been in the 200 page category and dreary, technically dissected chores at best. As if fated I ended up in a miserably cold, winter flooded, Gippsland region for a long weekend and with little else to do opened page one. Three days evaporated as I devoured this all engaging story. Oh my word what a journey. I was hooked. Since then I have read all of Feist, Eddings and countless others. 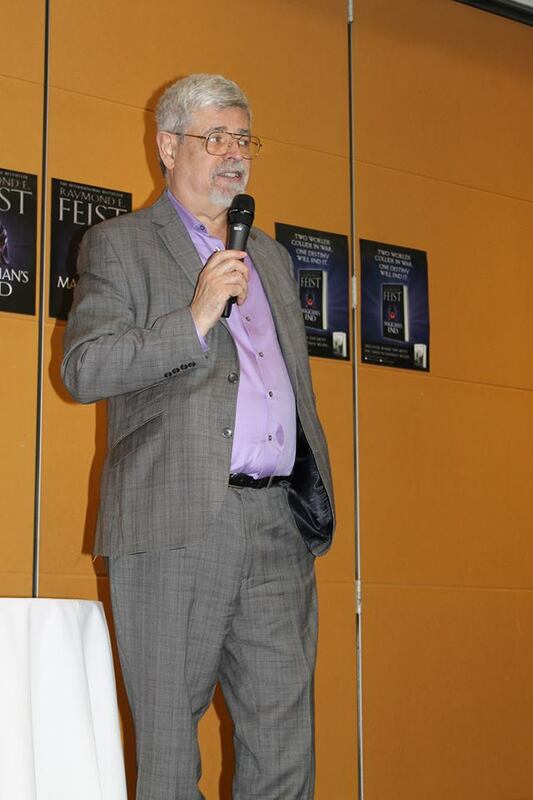 Jump forward some 28 years, last night my wife – an avid Feist reader too – and my friend Daniel from work attended ‘An Evening with Ray Feist’ in Frankston. Ray made a quip about having to drive out of state, that is to say Frankston is a long way from Melbourne. Daniel whispered ‘wait until he sees his car up on bricks’ which I found particularly amusing. Ray spoke for a solid half hour about his journey, life, love of his children, touched on sports, fine dining and of course Magician’s End. After all he is on tour promoting his latest release. He followed with a Ray driven and quite open, no MC interference here thank you very much, Q&A. 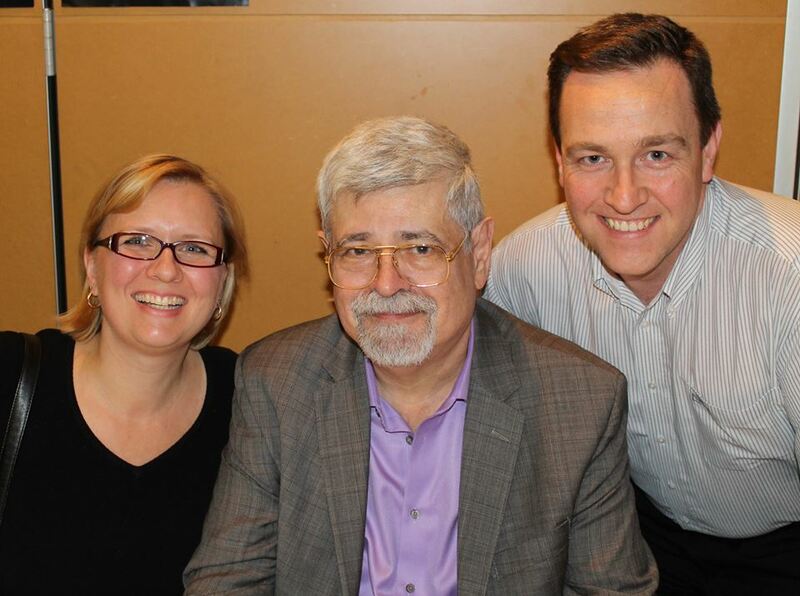 Questions ranged from advice to aspiring writers to which he answered ‘sit down and write. Don’t attend workshops etcetera, just write. Don’t stop and you’re a writer.’ Great advice indeed. Other questions touched on television and movie interest in his stories to his opinion on e-books and their effect on the publishing industry. He replied ‘I have no idea’. His books have been under e-book contract for 10 years and still he can’t tell if he is getting a good deal. The industry is dynamic and he’s along for the ride like the rest of us. There is no crystal ball. Like all good things the Q&A session drew to an end. Ray has endured a tough week after being delayed out of New Zealand and then a whirlwind weekend at SupaNova in Sydney. I think Melbourne – scratch that Frankston, received a wonderful delivery from a jetlagged, industry seasoned professional. Ray put in a great effort and showed interest in genuine engagement. The usual mayhem for determination of a signing line ensued with everyone shuffled about in milling confusion. Step in the lady from Robinson’s bookstore – plug for Robinson’s they put on a great night with food & drink aplenty and well organised, great value for $15. A few quick directions and order restored. At a guess there would have been 400 attendees and all carried multiple books, trophies of pleasant journeys held close to the breast. We had great seats for the night, right in the middle of the second row. 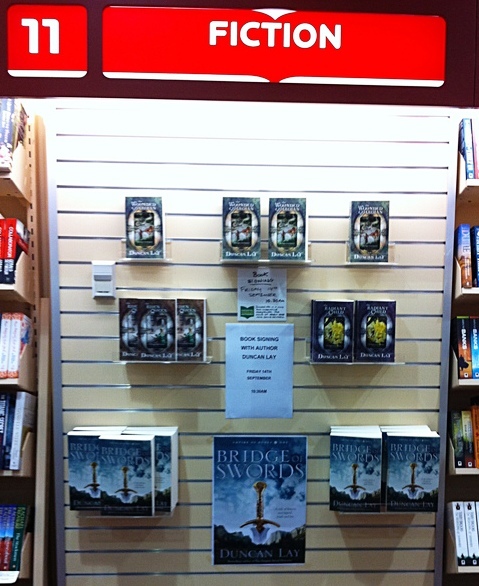 For the signing the Robinson’s lady decreed the front rows would go first. Wow, we were through in 15 minutes. Very cool! For me, the highlight of the evening remains clear. I got to say to my all time Author legend ‘I love your books’ as I patted him on the back after posing for the shot to which he replied ‘that’s great, makes me glad’. I’m certain he’s heard those words countless times before and it’s probably a bit corny however it felt great to say anyway. Without his vibrant stories I would not be who I am today. 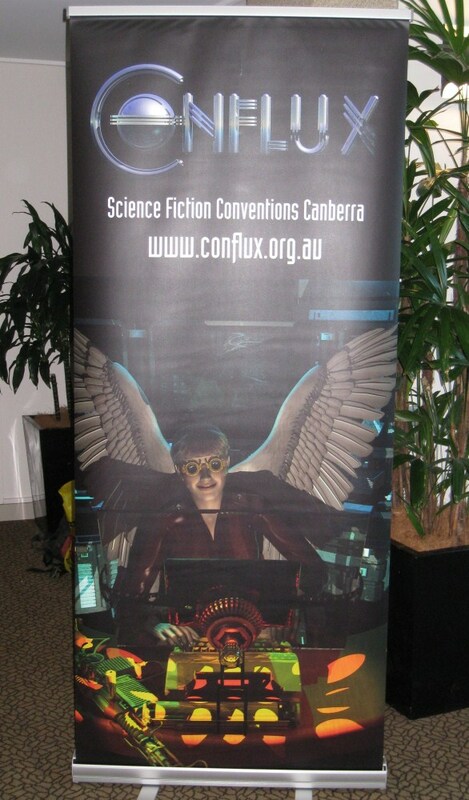 Last week I attended Conflux 9, the 52nd Australian National Science Fiction convention in Canberra. 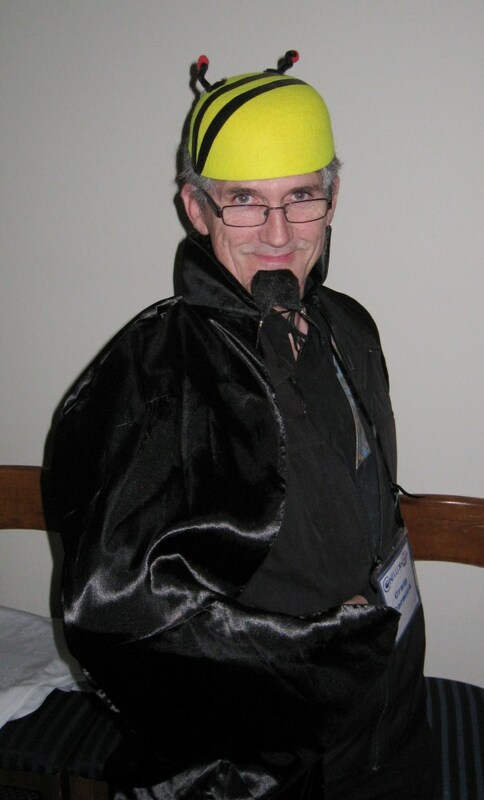 It’s fair to say like Worldcon in 2010, this convention exceeded my expectations. I attended a number of workshops, each one engaging and highly worthwhile. 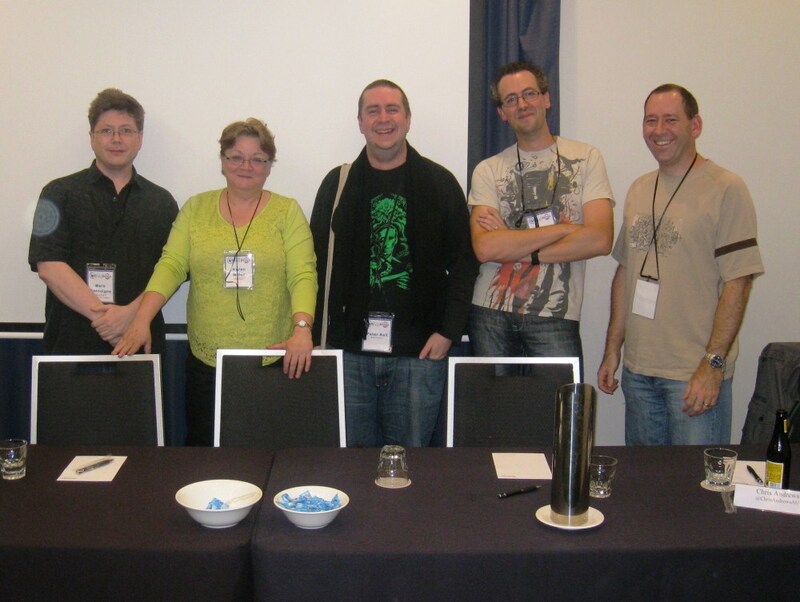 I listened to panels, interacted in kaffeeklatsches and pitched 2 novels! The thing with a good convention is they often end up offering so much more than the listed activities schedule suggests. From go Conflux 9 was something special. The breadth of members, the final count ran somewhere between 250 to 300 enlightened souls, offered so much to a writer like myself. I have listed out the very best bits and pieces I experienced in chronological order. Missing from this diarised reflection are the countless conversations with so many people from fans to cover artists, editors, authors you name it. Up at 5 am, uneventful flight from Melbourne to Canberra and a quick taxi ride to the Rydges Capital Hill hotel. Impressed to discover at 11:30 my room was ready. Quick unpack and rushed to the midday 3 hour workshop, ‘Writing with the five senses’ by Dr Gillian Pollack. We smelt, touched and listened to all manner of things and tried to transpose those sensations into words. Very cool. Gillian is a fantastic teacher and left me slightly high due to the strong aromas. A few panels during the late afternoon, one on ‘Elevator Pitches’ proved especially relevant as I had two, five minute pitch sessions booked for the following day – eek! Wandered down to the local shops and ate dinner then rushed back for the kickoff event followed by a fun cocktail party. The official MC was Craig Cormick, our Evil Overlord during the opening ceremony which ended up being hilarious and highly entertaining. During the drinks and nibbles I met so many wonderful people. Ended up talking in depth to Chris Andrews about a great many things only touching on writing for the briefest moment. 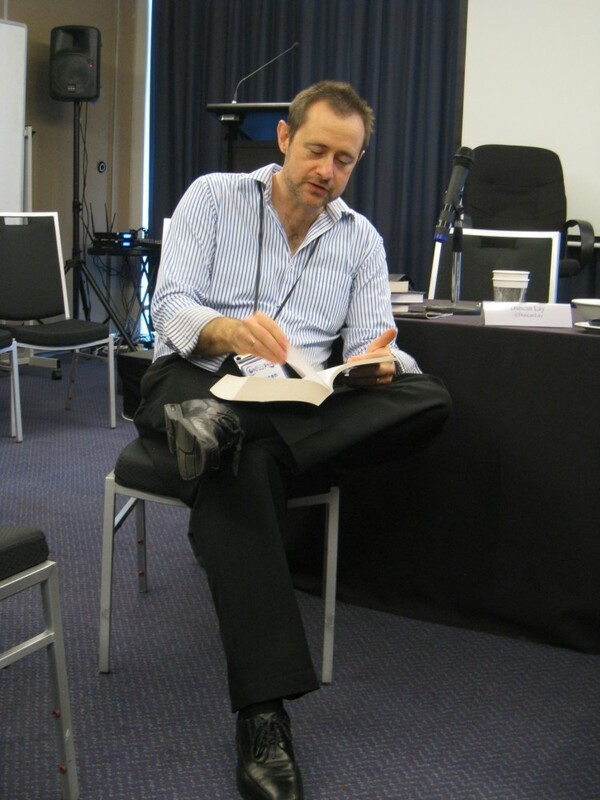 Up early again, breakfast and straight into an 8 am workshop – Distilling your story by Chris Andrews. He knows a heck of a lot about structure and how to get down to the knitty gritty elements that form the core structure of any story. Again very much worthwhile. I had been allocated a 5 minute slot with Tara Wynne a highly experienced and respected Agent of Curtis Brown. Like the others waiting in the small foyer, I felt quite nervous as I waited to pitch ‘Impatience’ for the first time ever, to an industry leading professional. Tara is lovely, down to earth and the time flew by. She asked for a few chapters and suddenly I stood on the other side of the door with a huge grin. Mission accomplished! 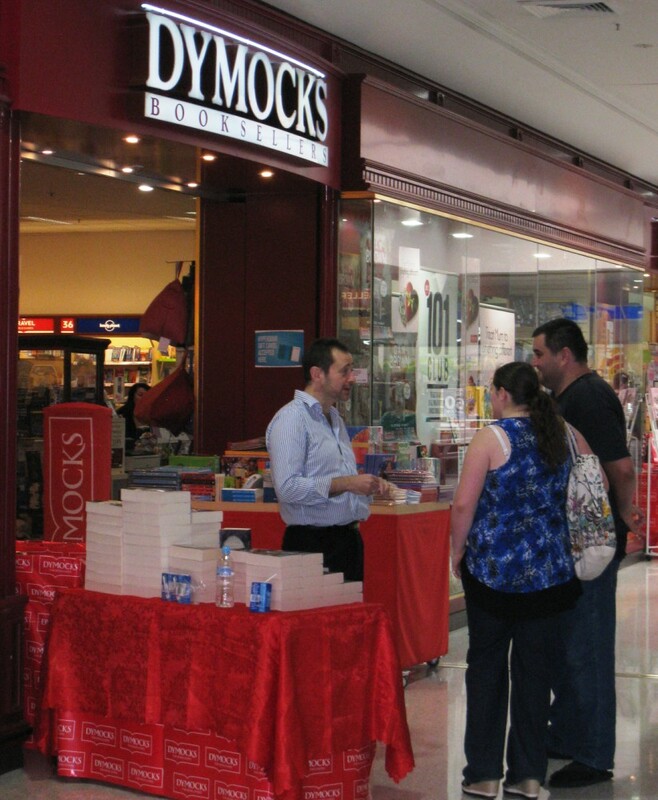 Lunchtime and it was away with Duncan to the Dymocks at Tuggeranong shopping centre. 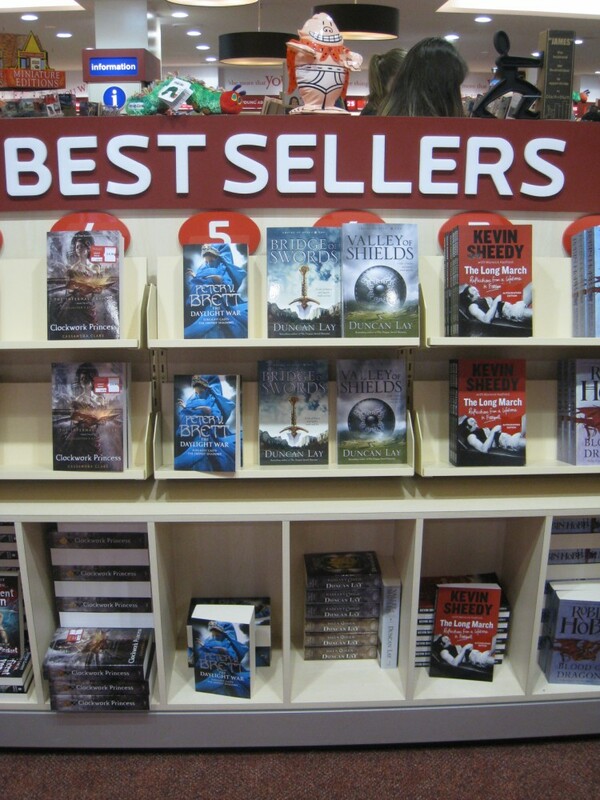 Duncan weaved his magic selling his latest book ‘Valley of Shields’, number 2 in his Empire of Bones series. I always enjoy doing this with Duncan. All too soon it was time to head back to the hotel as Duncan had a reading at 3:30. I also wanted to attend a reading from ‘In Fabula Divino’ by its creator Nicole Murphy. The book is an anthology, excellent collection of short stories however the reading was the same time as Duncan’s. Again and again this happened during the con and I had to make hard decisions. Such is life. I felt more comfortable with this second 5 minute pitch. Rochelle Fernandez, Commissioning Editor for Harper Collins proved to be like Tara, gracious and professional. I pitched Flight, my latest manuscript, entering the room with a strange air of confidence. Again the 5 minutes flew by and as it turned out, Rochelle also asked for it. Two home runs, speechless! In the early evening I attended the ‘Next’ anthology book launch. A great atmosphere with two short readings, drinks and nibbles. 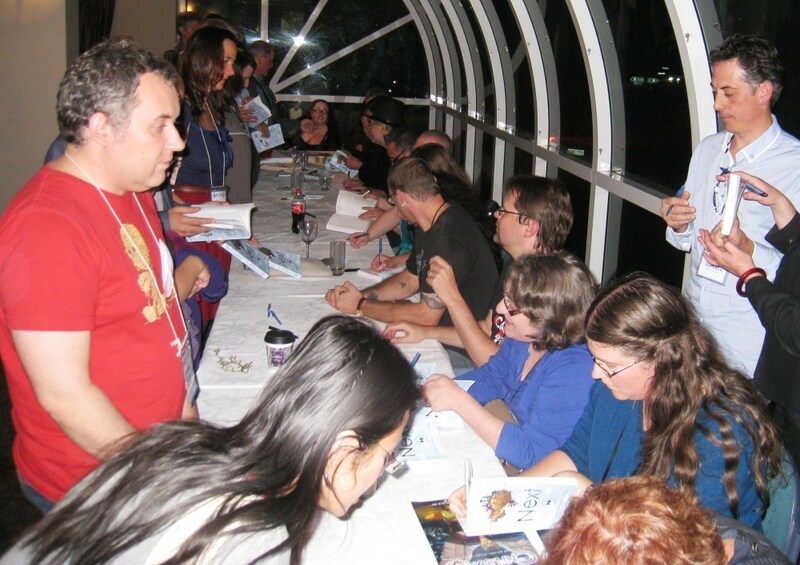 Many of the authors lined up in a long row happy to sign a copy. I’ve never seen anything like it. Lovely to meet everyone as again the half hour flew by in a whir of pens, wine and quick chats here and there. I also grabbed a quick shot with Rob Porteous. The costumes across the con were amazing from Steampunk to Period attire. I witnessed a dazzling array of finery and kick myself now for not grabbing more photos. Friday night was out with the boys, Chris and friends Marc and Luke Mercieca who were also attending the con. We drove for a while, don’t ask me where we went, for one I’m a Melbourne boy and two I was on a high from two successful pitches and a glass of wine. We eventually found an excellent Indian restaurant and settled in for a delicious and varied meal while talking television shows, movies and all manner of things. Back to the hotel for some well needed shuteye. With two successful pitches, time spent with Duncan and new found friends, it’s fair to say Friday was a huge success and highly memorable. Up early, well out of bed at least, by now especially in the mornings I was really starting to wane. Breakfast before an 8 am workshop once more this time by Anthony Eaton ‘Getting real with Worldbuilding and Characters’ which turned out to be mostly about identifying core story structure. Tony presented in some ways a similar workshop to Chris’ the morning prior however with a different slant on the story structure approach. Fascinating stuff. I flittered from one room to another, ending up watching a panel on the Ethics of Immortality. Many opinions across the topic and fascinating to hear what people had to say. 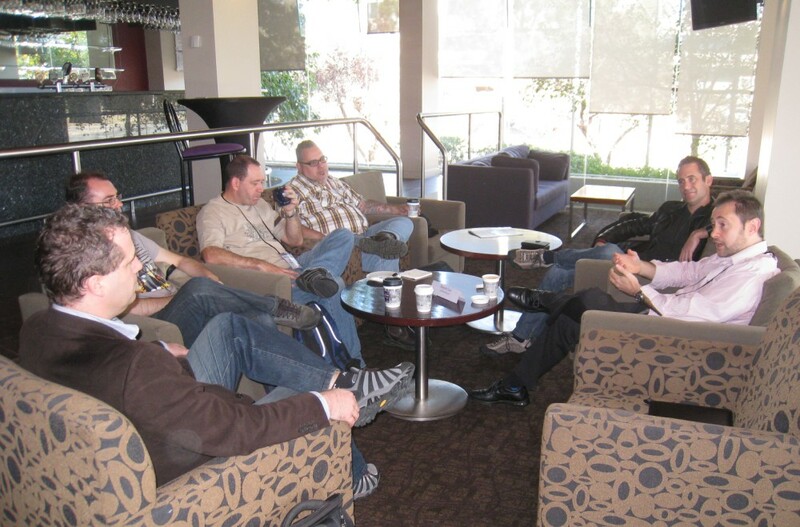 Followed the panel with Duncan’s Kaffeeklatsch with the guys and one or two others. The topics ranged from how he got started to the instore appearances he does. Session over, we headed out to another Dymocks, this time at Belconnen. More books sold then back to the hotel. Duncan had a panel to attend and I a second Kaffeeklatsch, this time with the gracious Kate Forsyth. Kate is an extremely talented story teller. She has a PHD in awesome, well not really, in reality she is studying for a doctorate in fairytales and really knows her stuff. Kate has been writing since she was 7 and is a bestseller across numerous novels. 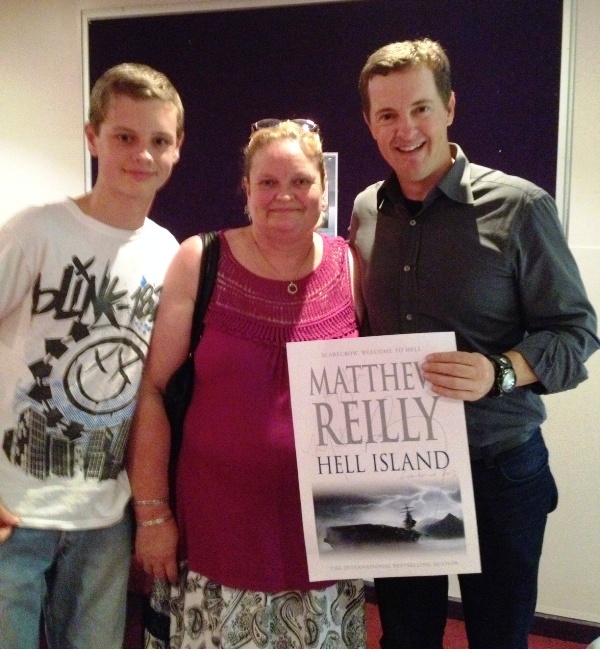 The group discussed everything from 50 Shades of Grey to Matthew Reilly’s writing and of course Kate’s many works. The photo was just after the session. I felt privileged to have met her and made the most of the opportunity to fire away as many questions as I could. Very cool. I stuck my head in for about 15 minutes at the Ditmar Awards. Again, cannot be in two places at the same time. I was insanely hungry having only grabbed a quick bite at the shopping centre. 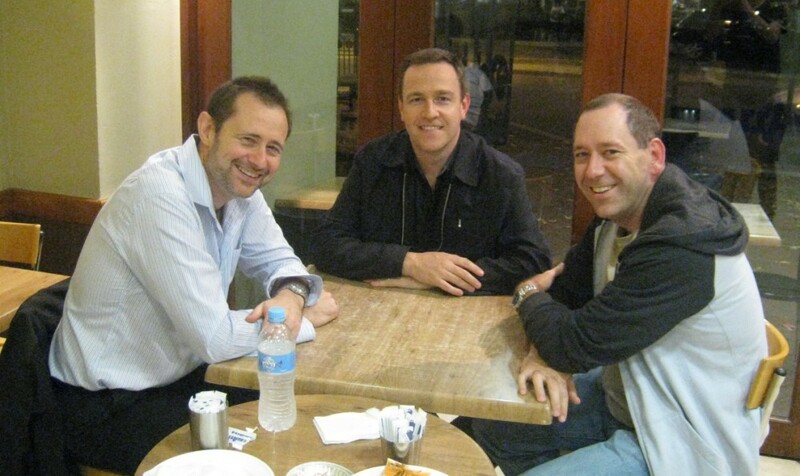 Duncan, Chris and I wandered the streets of Manuka eventually ending up at a Bakery for a pie and drink. Before long it was back to the hotel for Duncan and Katie Taylor’s joint book launch session. Purchased both books and Katie’s previous first book of her series. Duncan had to depart after the launch and I moved on to the Star Wars panel. What a hoot! Some great minds in the room spilled forth the most outrageous suggestions. A lot of fun and a great way to unwind after a long day. A large group descended on the bar whilst the Disco was underway – kudos to Sean Williams for an amazing mix of dance tracks. After days of intense learning and rushing about it was really nice to have some downtime accompanied by a few easy drinks. I think we called it a night around 2 am. I heard talk of an in-room party yet simply had nothing left to give. Fell into bed, exhausted, tipsy and yet so very happy having spent such an amazing day with the most wonderful people. 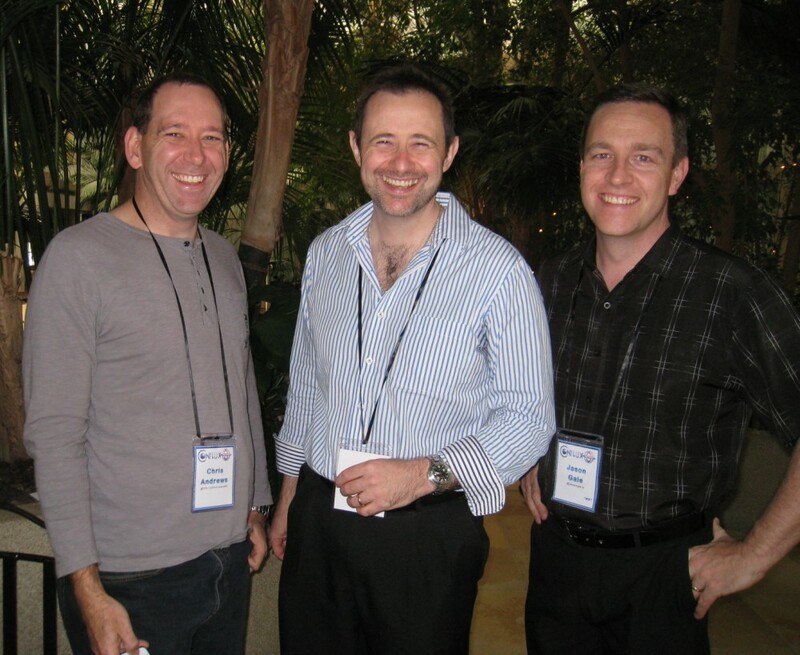 No workshop – sleep in – yay! Had a very lazy start to the day. To be honest I doubt I would have made another 8 am workshop. I made it half awake to the excellent 10 am panel – ‘Does a cover sell a book’. I had never really stopped and thought about the impact different covers have and the work that goes into a successful one. Very interesting. By 11 am my brain, after downing 2 cups of coffee, was finally awake and I enjoyed a reading by Kate from her ‘The Wild Girl’ novel. In fact I liked it so much I bought a signed copy. I felt panelled out by lunchtime. Chris had graciously offered a lift to the airport and I decided to chat to a few people I had missed over the days before heading off. That’s the thing with a convention, the time goes so insanely fast as you’re always rushing from one thing to another. It’s a good rush, it has purpose – exposure to as much writing relevant content as possible and yet after 3 days I felt full. Pleasantly so. Enjoyed a wonderful conversation with Zena Shapter about finding your voice. Said hasty goodbyes to at least a dozen faces and then in the car. Arrived at the airport to the stark contrast of a subdued flight lounge. A safe trip home then reunited with my family. Yay. Thanks to everyone I met, you made my convention so memorable. 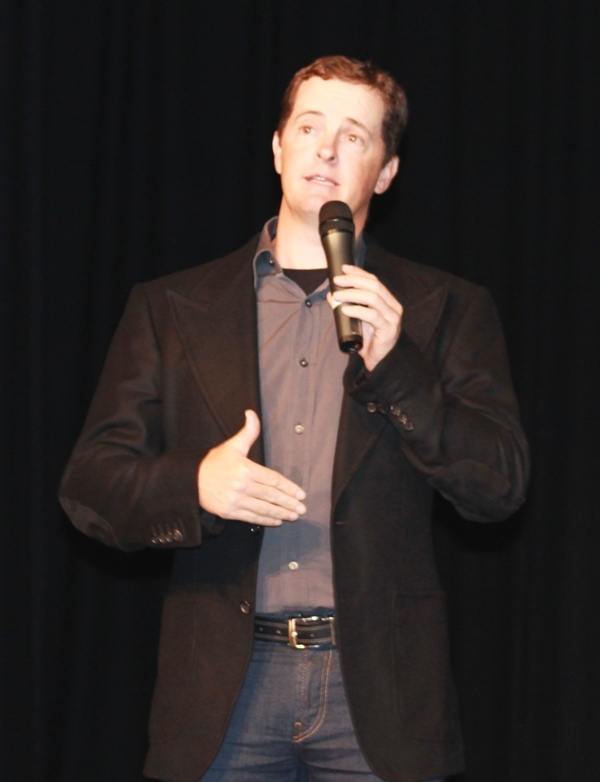 Monday night I, along with a bunch of friends, had the pleasure of meeting one of my all time writing idols, Matthew Reilly. 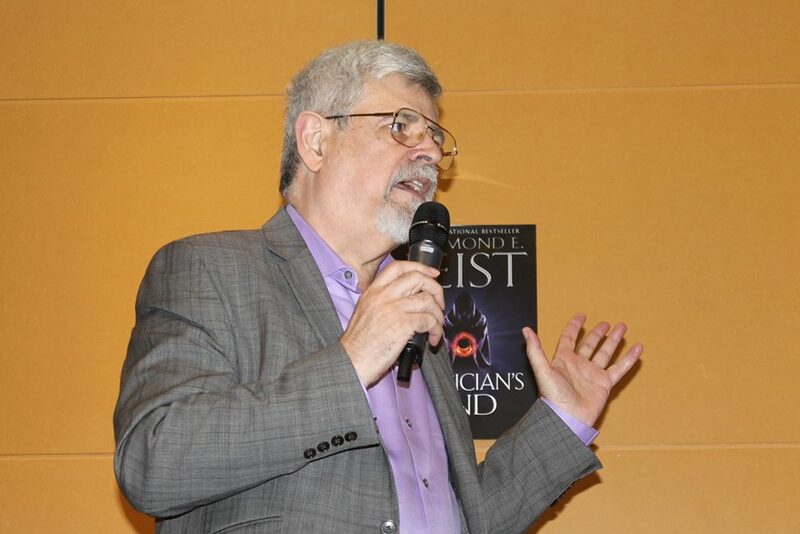 He gave a free 1 hour presentation encompassing all of his books including some exclusive titbits of upcoming novels. That’s plural if you missed it. Very cool. The venue was packed. Along with 259 other fans, I listened, laughed and engaged directly with Matthew. He spoke of the film options of his books and I asked a question. Fascinating stuff. Friends asked questions too. This was awesome! I guess the thing that impressed me the most was how down to earth he is. I actually greeted him upon arrival as I happened to be standing alone outside the entry doors when he strolled down the path. I introduced myself and shook his hand. Insert happy dance imagery. We had a quick chat before I led him inside and out of the blistering Melbourne sun. Again, very cool. A bunch, perhaps 25 or so, fans were early and granted access into the theatre when doors opened at 6 pm. He was scheduled to present from 6:30. At 6:05 he wandered out across the stage, pulled up a chair and began to speak. Casual like, inviting questions. Real, human, open and interactive. He didn’t have to do that, in fact he didn’t have to come down to Melbourne – he lives in Sydney – at all however he did. Very cool. Like all good things the hour flew by and his presentation came to an end. A flood of humanity was held back by the library members who organised the event. They managed the crowd well as I think they anticipated we all might try to swamp him at the signing. Alas I was unable to remain behind due to family commitments. Instead I left a book behind with a close friend and, of course, Matthew signed it. Very cool. For Matthew, describing him as affable doesn’t cover it. He is an enthusiastic, patient and genuine person. Did you catch the bit where I mentioned he gave up his evening for free? He made a point of mentioning anyone with children should line up first for the signing so they can get away at a decent time. The signing didn’t end until almost 10 pm. Matthew remains the very model of the author I aspire to be. What a month November was. NaNoWriMo is done… phew… No fanfare this time, no balloons. I made it, just. Scraped through with 50,594 words. 2 years ago I wrote a smidge over 70,000. So why the difference? Firstly I’m 40 now. Writing past midnight, after working all day, is no longer my thing. I struggle to put anything coherent down once my eyes start complaining and my head feels like it’s stuffed with cotton wool. Secondly, I descended into November in a bit of a rush. I was far better prepared in 2010. Back then I had a detailed outline, a vibrant fantasy world and rich character backgrounds. The words practically wrote themselves as they poured out. This year, in October, I worked an outline halfway through and abandoned it in light of something a bit simpler. With only a few days to the November 1 start date, I realised the original concept would be overly complex. It required far too much research. With a large 50,000 word deadline I needed to hit the ground running. The trick with NaNo is to write, every day, and keep the words ticking over. In principal this is a great habit to form. Although for me I don’t feel I need this lesson anymore. I’ve written 5 full length novels plus many short stories. The writing part has never, and probably never will, be a problem for me. When I’ve a story to write, I write it, although I do it my way. It takes as long as it takes. I don’t normally rush my prose as it ticks over by itself well enough. I do detailed research; Google is my friend, as I go. Sometimes the words halt, for a day or maybe two, as I work something out before ploughing along. Thirdly, I simply had a busy November. Busy at work. Very busy at home. Distractions popped up here and there, stealing my time and focus away. I’ve never felt so squeezed to find time to write. No idea why this happened, best laid plans and all that. My family helped where they could and I’m eternally grateful but life seemed to get in the way again and again. Toward the end of the month, as I passed the 45,000 words mark, I can remember thinking I would only just make it. I can honestly say if this was the first story I had ever written, I would never have gotten over the line. I used every trick in the book to push through. So here I am with half a book down but I’ll get to that later. For now I’m busy once more. My December, thankfully, has been pretty much normal. I’ve had considerably more time to do my thing. Specifically I’ve applied all of my editor Susan’s changes to Flight. Wow, for the first time I have a polished manuscript. The story presents well. It flows better, conforms to industry standards. To see a core idea chiselled into a magnificent end product is really something else. I’m so proud of this novel; it has heart and life plus an interesting and unique plot. Applying the changes, and honestly there weren’t that many, page after page gave me such a feeling of satisfaction. Importantly I’m now confident to send Flight out as a completed product. Back to my half book, this story’s an urban sci-fi, titled ‘DreamState’. The main character can astral travel and specialises in ‘dream walking’. He helps people deal with nightmares. Pretty cool really. Anyway, I like this story, a lot. It has a touch of my first book, which was wildly too big for a novice author to do justice. The premise grants me space to stretch my writing about unusual and interesting things. It’s a lot of fun to do and very rewarding. As I said to complete NaNo I used every trick in the book. This time I wrote third person limited, that is from a single characters view point. I usually tend to do a fair bit of head hopping in most of what I write and this is okay if it’s controlled and does not occur too often. I especially do this when I’m tired and writing fast. My third book, Impatience, I wrote the first version in 9 weeks and it jumped around a lot. ‘DreamState’ is presently on hold. I’ve never written a book and shelved it half way through. It feels weird. Insert sad face. The characters are barking at me to keep going and tell the rest of it. Sigh. I need to focus on applying all the professional edits. I’ve 500 pages of Impatience with full mark-up to work through, and that will take considerable time. DreamState deserves my full attention and I simply can’t do that for now. I doubt I will do NaNoWriMo again. It doesn’t suit my writing style. I don’t believe I get enough out of the month to justify the required absolute devotion. Plus twice is enough I think. One might argue I now have half a story down however the writing is not to my usual standard and I will have to rework more than usual. The point is I would have written it anyway, perhaps early into the new year. The concept has been floating around in the back of my head for quite some time and wanted to get out. My plan for 2013 is to heavily promote Flight and Impatience. 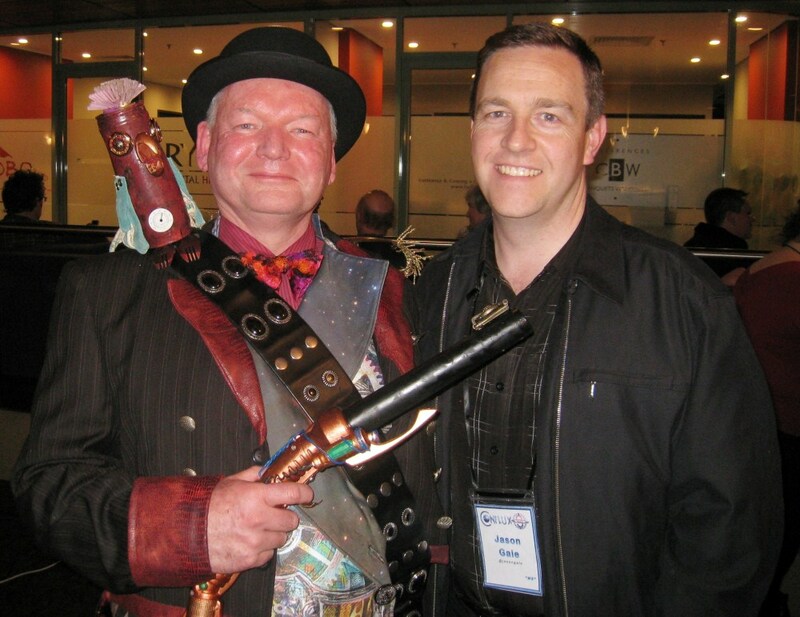 In April I will be attending Conflux 9, the 52nd Annual National Science Fiction convention, held in Canberra. I am really looking forward to this. 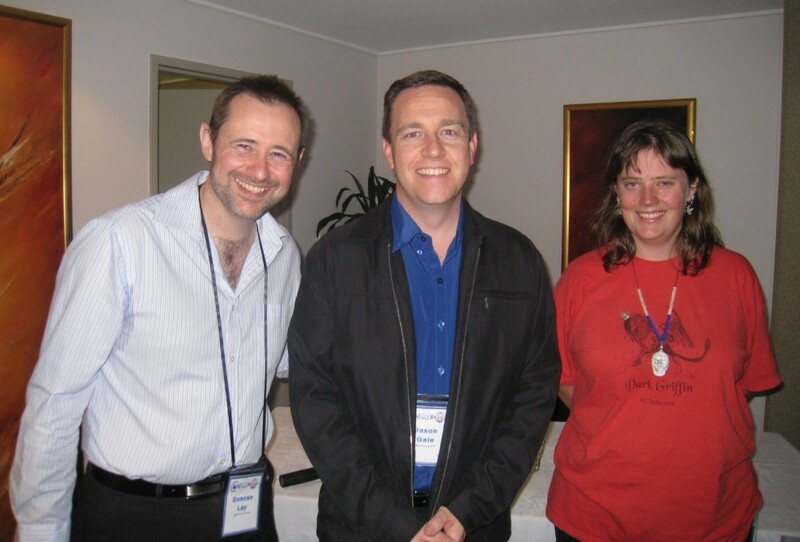 The last convention I attended was WorldCon back in September 2010. Conventions are a great way to meet new people and talk the talk. Very much worthwhile! Like WorldCon I will report bits and pieces here as I go. Over the last six weeks I’ve edited ‘Impatience’ as it presently hovers around the 120,000 mark. Specifically I’ve performed a complete pass of line edits, that’s reading every sentence and adjusting the structure, grammar etcetera. Secondly I’ve also tweaked ‘Flight’ my latest novel. I’ve made many minor adjustments suggested by my proof readers, thank you one and all, and also added in a bit more detail where I thought the story needed it. Why have I smashed through this editing now? The answer’s below however please bear with me as I provide a little back story. Over the last six months I’ve become an active member of Writers Unite, a writers group run out of the UK for aspiring and published authors around the globe. 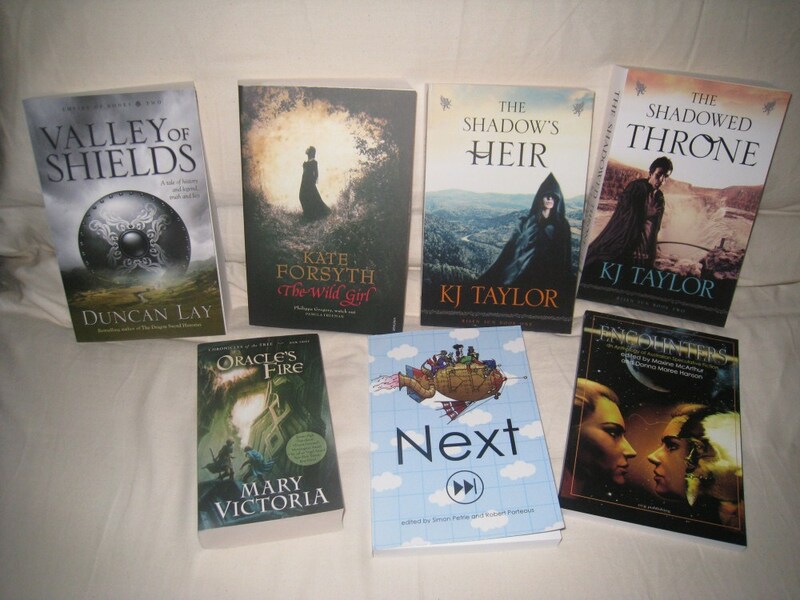 During this time I’ve gotten to know a number of authors, almost all either traditionally published or independantly delving into the realm of e-books. I’ve learnt a great deal from them all. Lisa Fender, one of these talented individuals, suggested I contact Susan Uttendorfsky of Adirondack Editing in New York. 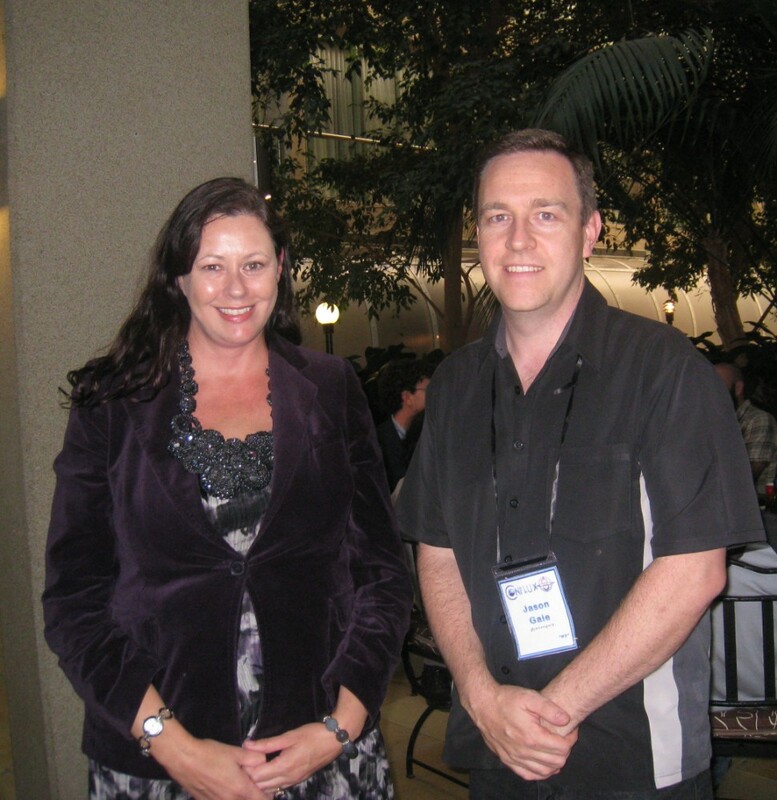 Susan is an editor with her own business and importantly 25 years industry experience. Secondly, last week I took off the editor’s hat and became a student. A pupil of talking to readers. 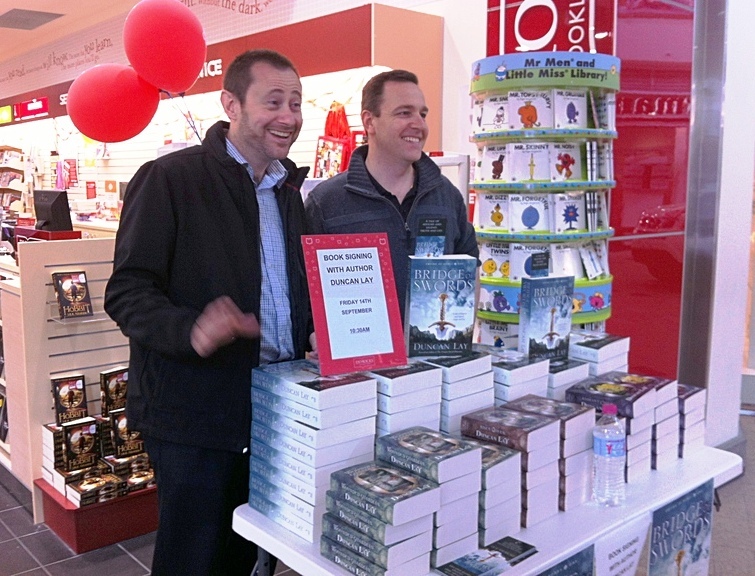 I spent two days running around Melbourne with Duncan Lay, an Australian best selling fantasy author. 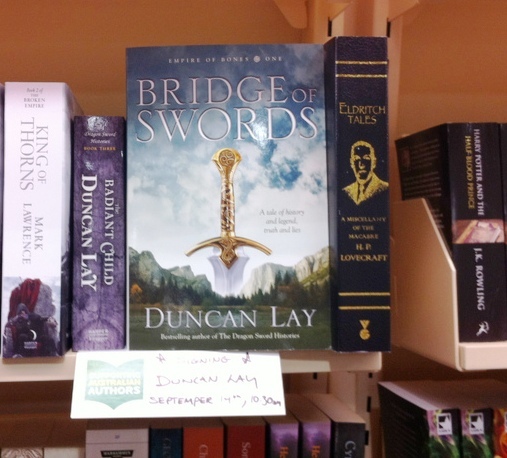 I’ve commented before about Duncan’s ‘The Dragon Sword histories’ trilogy. In short the series is a fantastic read and I couldn’t put it down. 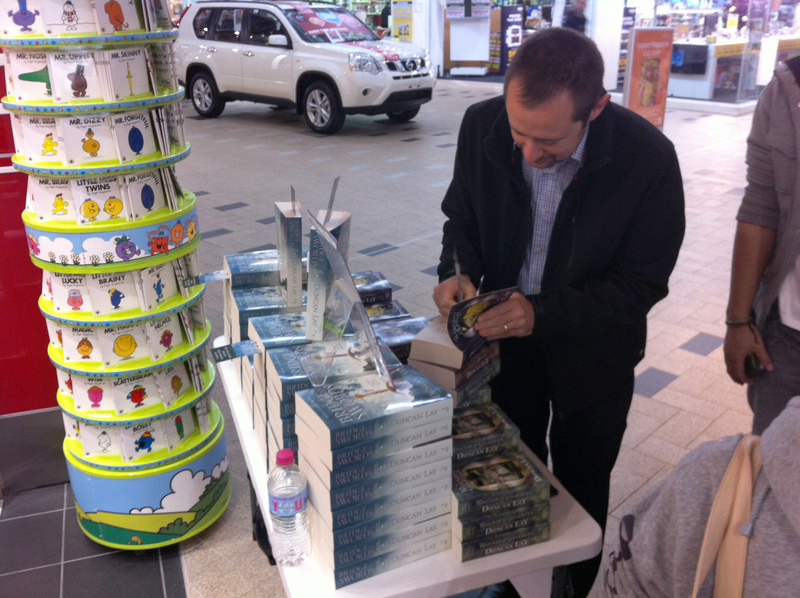 Duncan was in Melbourne doing instore appearances as part of his tour to promote the first book of his second trilogy. 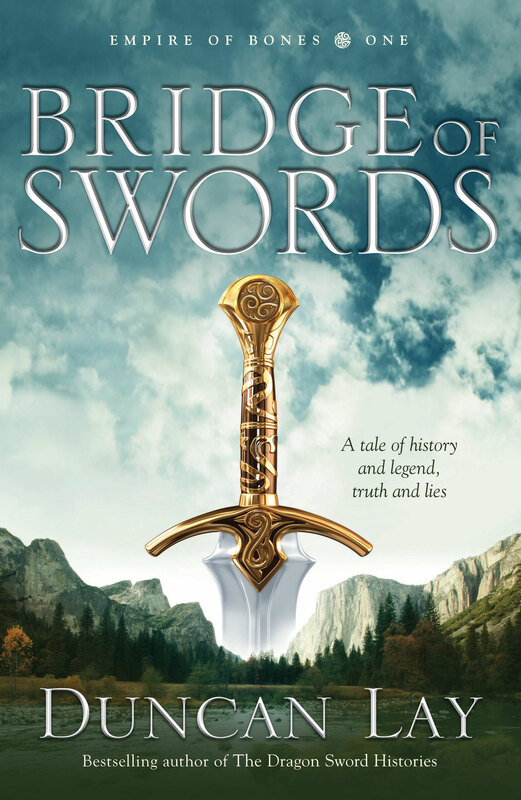 Bridge of Swords kicks off the ‘Empire of Bones’ series and I’ve been dying to read it. Duncan is very affable, an easy going polite and all round nice guy. He has a confident, enthusiastic and positive approach to talking to readers and is well suited to the joys, the ups and downs, trials and tribulations of authorship. There’s so much more to being an author than writing good books. Promotion, dealing with publishers, agents, stores, readers, reviewers, social media the list goes on and on. To do all of this in an efficient and effective manner is quite a feat. I’ve learnt being successful at this writing game is of itself an art form and one I’m very keen to learn. To have the opportunity to experience this first hand from someone so talented I believe has been time well spent. 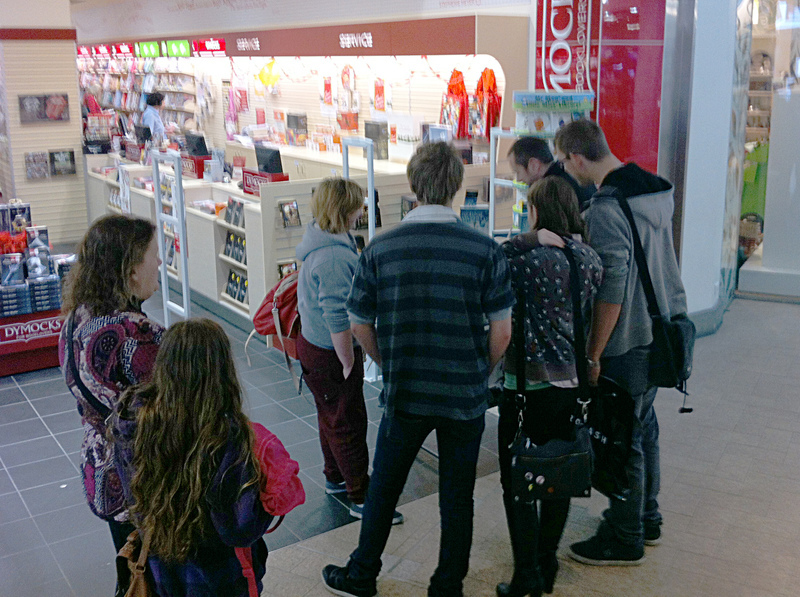 Over the 2 days we visited 4 Dymocks stores and one independant. 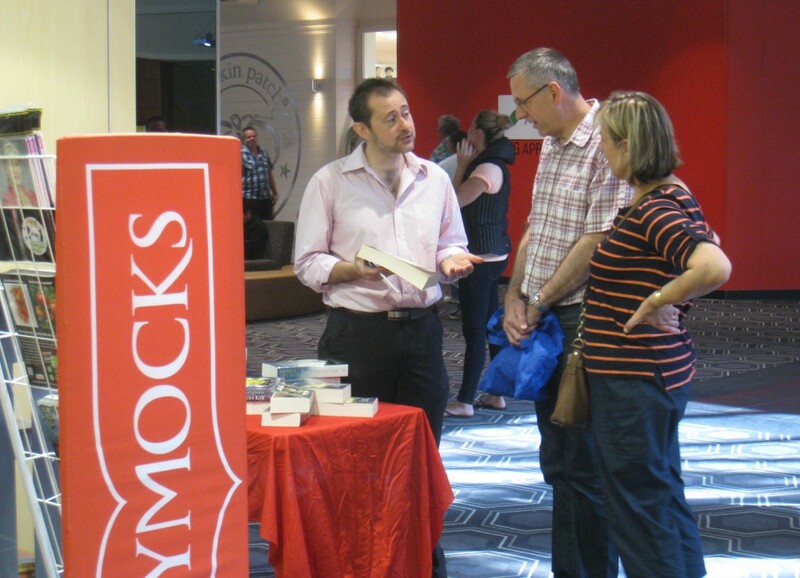 Dymocks staff welcomed Duncan and surprisingly myself, warmly with genuine appreciation for the time taken to visit their store. It was fantastic to see Duncan make a reader’s day by offering a signed copy. The personal touch and attention to detail had many customers departing with an excited smile. It might sound a little corny and I’m probably not doing the process justice however I found myself often becoming excited for the reader as they purchased Duncan’s novels. I knew they would have a great time reading and like I did 2 years ago, remember meeting him. And how do I spell that? Writing this book proved to be a hard, occasionally tedious at times, slog. It’s very different to the others. I’ve got copies out to beta readers at present after harrasing my usual dependable core set of alpha readers throughout the writing process. You know who you are (thanks guys!) Suprisingly the alpha’s reported back less typo’s than usual. I must be getting better at this or perhaps I wrote across a greater percentage of pre-midnight hours, before the slightly dyslexic and grammatically challenged monster bangs away on my keyboard in that half awake half asleep state. I’m taking a break for a while. How long I honestly don’t know. A few weeks maybe even an entire month, whatever feels right. I intend to return in earnest and put the editor’s hat back on. I want to perform at least a few passes through the entire manuscript before I need to focus on prep for NaNoWriMo in November. Flight is only 65,000 words, the smallest so far and I’m hoping the editing process might be a little less all absorbing this time. Optimisitic I know. We’ll see. What else, I’m reading another Clive Cussler, do I sound like a broken record? I’m drawn to his books and while I know deep down I simply have to broaden my reading spectrum, they are so good! I get sucked in again and again. Lots of ideas swirling around, mostly from dreams, for the NaNoWriMo story. Exciting times. My how time flies when you’re having fun! Over the last 6 weeks I’ve written considerably more of my current novel’s first draft having worked through some tricky bits and pieces. I estimate I’m around 80% through and I can see the faint glow of light at the end of the tunnel. I’ve managed to write most of my short story as well however I think it requires some rework. I’m struggling to focus on this while entrenched in the bigger challenge of my novel. The short story keeps trying to grow into another book and I can’t do it justice for now, eek! I’ve read another Clive Cussler ‘Pacific Vortex’, the first in his preferred reading order. I liked it, the story was bold, genuinely entertaining and yet not overdone. He actually wrote this book first, many years before the Dirk Pitt character became huge. When you think many of his books from the 1970’s are touching on 40 years old they hold up surprisingly well. Maybe I’m biased as I love all things nautical however I willingly find myself trapped in his books again and again. As April rapidly draws to an end, I need to push through my novel and close out the first draft. Hot on its heels I need to begin work on the considerable preparation required for NaNoWriMo. In case you missed it from a previous post, I’m going to commit to producing 50,000 words again come this November. I did this in 2010 and believe me when I say it’s hard. Writing a sizeable volume everyday takes determination and real commitment. Last time I had a detailed outline for my Healing Truth book and I wholeheartedly believe without this I would never have achieved the volume. As it turned out I did just over 70,000 by months end and hope to achieve the same. That’s about it for now. Lots of work, planning and more work on the horizon. I often wonder what you, my blog readers, want from this blog? I read many writers blogs and find it strange hardly anyone talks about what they are actually doing, the process of writing. There are many sites which give fantastic advice in general however I know most of my readers aren’t actually writers and therefore I wonder how relevant that information is? Other blogs seem to provide a running commentary on the many changes within publishing at present and or comments / opinions on industry news. This is interesting to me however is it to you? While I occasionally add a comment here or there, I’m an aspiring writer and I like talking about what I’m doing, my journey and what is going on. What it is like to work through these stories. The question is do you like that as well?